NXT-ID recently completed an essential round of funding to position ourselves to launch our product to the general public with a particular emphasis on the upcoming holiday season. Much has happened at NXT-ID, and with the payment industry, since my last shareholder letter in September 2014 following our uplisting to NASDAQ. In the intervening time period we have executed the plan that we proposed at our uplisting. We have taken our Wocket design from a working beta model through to a finished manufactured product; which in the case of the Wocketcard means enclosing a package of sophisticated electronics in a card less than 1mm thick! We have almost doubled our staff and have developed an onshore customer service team based out of our Florida distribution center. In addition our fulfillment team is in place and has been busy delivering Wockets! We have delivered all our preorders as well as those on our invitation list and we are now gearing up for general sales. We are getting a positive reception from our customers and incorporating their feedback in the continued development of our product. One of the advantages of Wocket is that we can remotely update the software for both the Wocket and Wocketcard so our consumers can always enjoy the best available experience with our product. We will be launching our first software update very shortly. The big question on everyone’s mind is how Wocket works with EMV, or the new chip cards that are beginning to be distributed by the major card services. The flexibility of the Wocket platform means that we can support NFC (Apple Pay and Google Wallet type technology) and EMV, as well as Bluetooth and other forms of payment as they become prevalent in the future. We are reaching out to card issuers to incorporate approved tokenized secure payments into Wocket. This will mean that Wocket will not only have the ability to protect your credit cards, and other sensitive information, by verifying your identity before granting access to them, but also protect that data as its being transmitted for settlement. We also have a method for doing this for online transactions as well. The payment industry is rapidly changing with digital transactions allowing consumers new ways to pay and chip card technology (EMV) is being introduced across the United States at an estimated cost of $8 billion. Apple Pay has brought increased consumer acceptance to “pay by phone” technology and Google Wallet and MCX (led by Walmart), will be launching or re-launching their platforms as well. In addition many stores and restaurants will have apps available to pay by phone emphasizing the fragmentation in next generation payment systems. However, the number of legacy point of sale systems (POS) that need to be replaced to use these new technologies is enormous .Javelin Strategy and Research estimates the total number of terminals in the US to be 15 million and there are over 1 billion credit and debit cards that will require EMV chips. Although rapid progress is being made, it will still take a number of years for these new technologies to be ubiquitous. Wocket can bring tomorrow’s security solutions to most legacy POS systems today while incorporating the ability to pay on new digital systems. While new payment technologies provide convenience and wireless features, the fact remains that consumers still have to carry a wallet containing cards to access ATMs, pay when their phone dies or loses signal, checkout at locations that don’t support NFC and carry cash. Rather than a few hours of battery life between charges on smartphones, Wocket has an unprecedented minimum of 6 months battery life between charges with typical Wocket use. 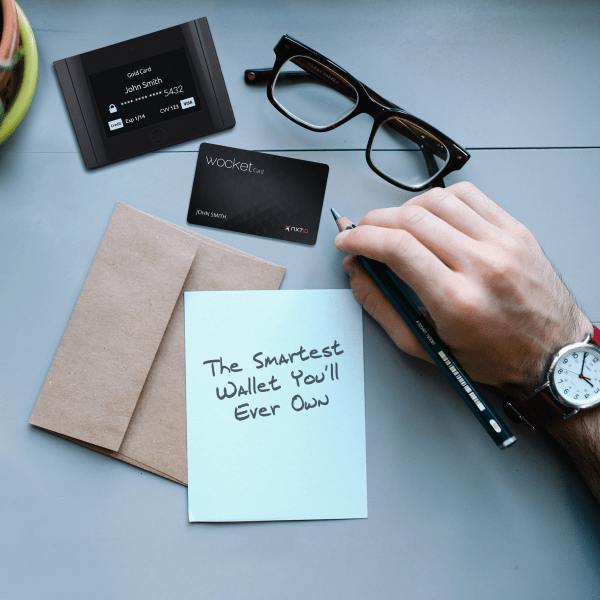 Wocket secures all the information and cards consumers commonly store in their wallet, allowing them to continue paying with and use their credit, debit, loyalty, and insurance cards just as they do today. Wocket can even store login credentials and one thing that no digital wallet can ever replace – cash. Wocket completely replaces the wallet and hosts a new generation of smart wallets that combine fashion with personal security. The payment industry is currently undergoing massive change and we appreciate our shareholder’s support in embracing our unique technology and approach to payments with Wocket. We continue to believe we are delivering something of value to consumers and the market that has not been done before.